City Landing is located in the Financial District near the Aquarium, filling Sel de la Terre’s old space on Atlantic Ave (at State Street). It’s been on my list since it opened about 2 years ago, but the original menu seemed a bit pricey so I never stopped by. I took a peek recently, and not only did the prices look more appealing, but the menu had such a great variety I knew it’d be a great spot to bring a large group of people. Not only does City Landing have a wide range of contemporary American dishes, but it also offers a full vegetarian, vegan and gluten-free menu. Even the dessert menu has at least 1 vegan option. I’ll eat just about anything from any menu, but it’s nice to have so many options for different types of people / dietary restrictions. It took a while to decide what to order – soup and entree? salad and pizzetta? – but the fall flavors made up my mind for me. It’s hard for me to not order seasonal dishes – like pumpkin anything – so I knew I’d be trying the Curried Mussel-Pumpkin Bisque with thyme creme fraiche. A beautiful presentation that matched the amazing flavor. 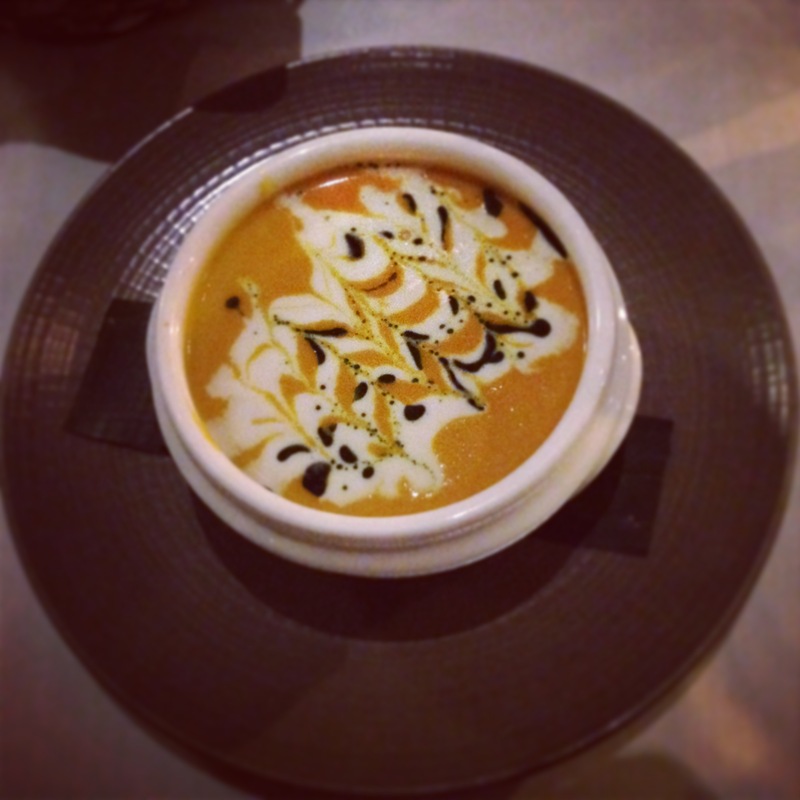 I’ve never seen pumpkin bisque paired with mussels, and it didn’t upset me, but it also didn’t make or break the dish. 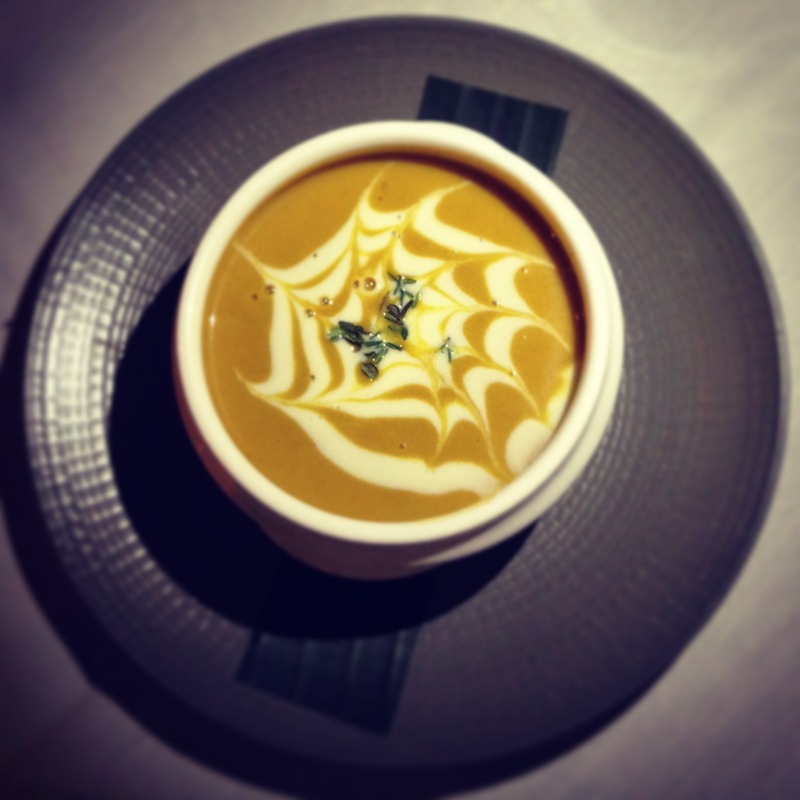 Mussels or no mussels, this is one of the best pumpkin soups I’ve had all season. 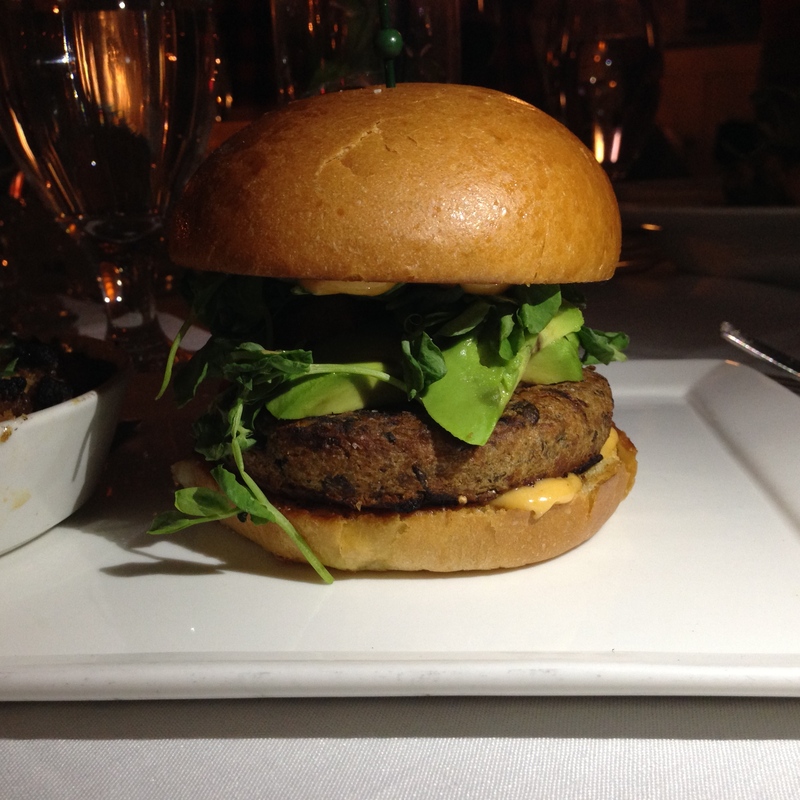 For my entree I had the Veggie Burger with chipotle aioli, avocado, roasted red pepper, pea tendrils. 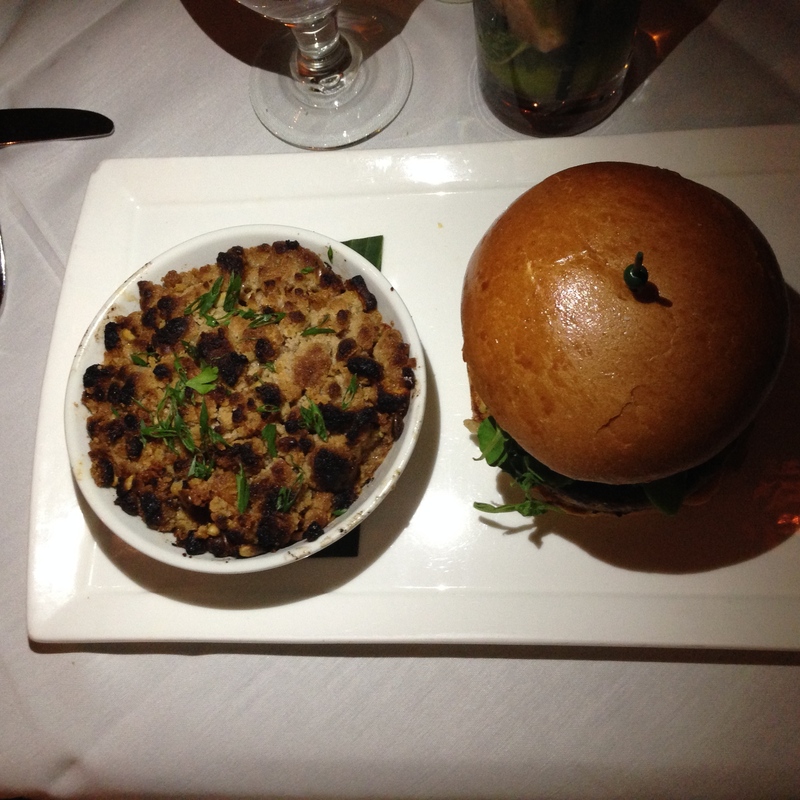 This burger was loaded with toppings / condiments that really made this dish what it is. It held together well and had a nice consistency, but the flavor really came from the aioli, avocado, and red peppers. A winner in my book, and I’ve had a lot of veggie burgers in my time. The veggie burger came with a “choice of fries or greens” but instead I asked for a side of the Butternut Squash Crisp with sage sunflower seed streusel. I confirmed before I ordered that it was in fact a sweet side. Sweet or savory, it sounded too good to pass up, and I was right. The crisp topping is the same you’d find on any fruit crisp. A perfect fall / Thanksgiving-inspired side dish. I told my husband he could try a few bites of the Butternut Squash Crisp if I could dig into his side of Creamy Pumpkin Polenta. This is my favorite preparation of polenta: creamy but slightly gritty. 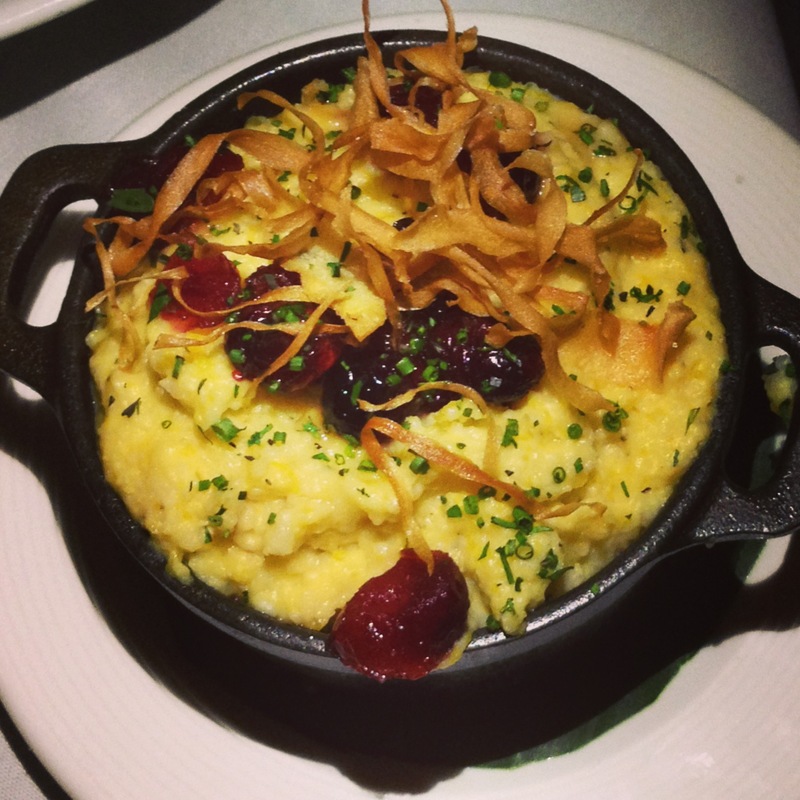 If you’re a polenta fan it’s definitely worth a try. 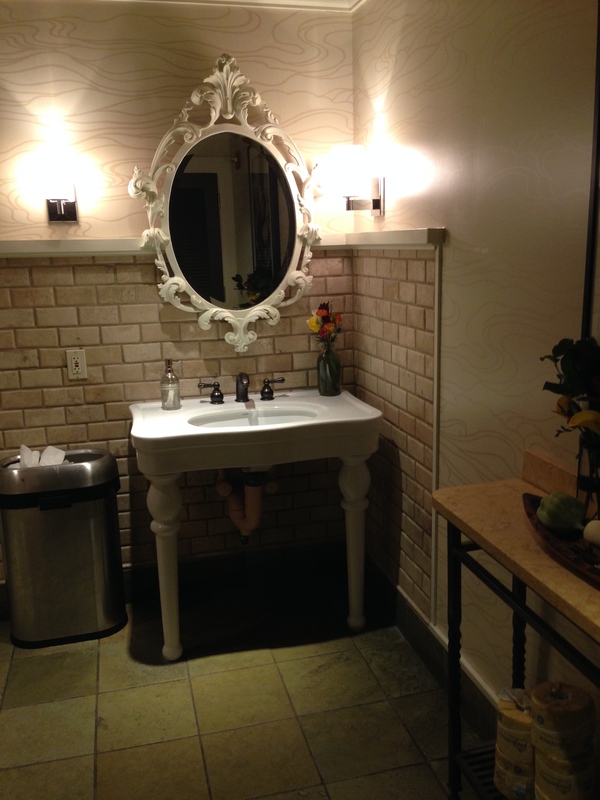 The women’s room was well decorated with a pretty statement mirror. Overall I would absolutely recommend City Landing. We went twice within 3 weeks, and each person we ate with really enjoyed their meals. Some popular and well-liked dishes among our friends were the Roasted Boneless Half Chicken, the Caramelized Day Boat Scallops with mushroom ravioli, and the Bucatini Lamb Bolognese. The second time around I had the tomato soup with the large New England Chopped Salad with no blue cheese or bacon. The salad was ok, but that was my own doing since I removed 2 key ingredients. The Caesar Salad was popular however (my husband ordered it both times). Besides my poor salad decision, every dish everyone ordered went over very well!